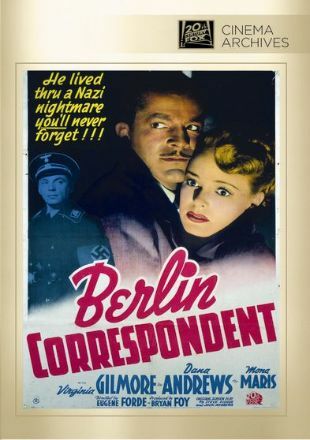 Berlin Correspondent is a cut-rate variation of Hitchcock's Foreign Correspondent, courtesy of 20th Century-Fox. In one of his first important film roles, Dana Andrews plays Bill Roberts, an American radio commentator station in Berlin in the months before Pearl Harbor. Having witnessed Nazi brutalities first hand, Roberts hopes to alert his listeners of impending dangers, and does so by sending out coded messages during his broadcasts. The Gestapo begins to suspect something and assigns glamorous secret agent Karen Hauen (Virginia Gilmore) to spy on Roberts. When she discovers that her own father (Erwin Kaiser) is supplying Roberts with vital secrets, she turns her back on the Nazis and joins our hero in his efforts. The film winds up with an exciting airborne escape from Hitler-land. Arte Johnson fans please note: At one point, the head Gestapo officer (Martin Kosleck) actually says "Verrrry interesting"!